A number of critical life issues are directing us to the same conclusion based on our pro-life feminist beliefs: All lives have worth, no matter their size, age, gender, location, disability, or parentage — or any other excuse for discrimination and violence. Feminists for Life of America opposes the destruction of a human being at any age, including newly created human beings by scientists. While we understand the stated goal of gene editing is to eliminate genetic disorders, such as cystic fibrosis, and we share in the desire to save parents and children a life of hardship, we also know that we have eliminated human beings who are not “perfect” through abortion. 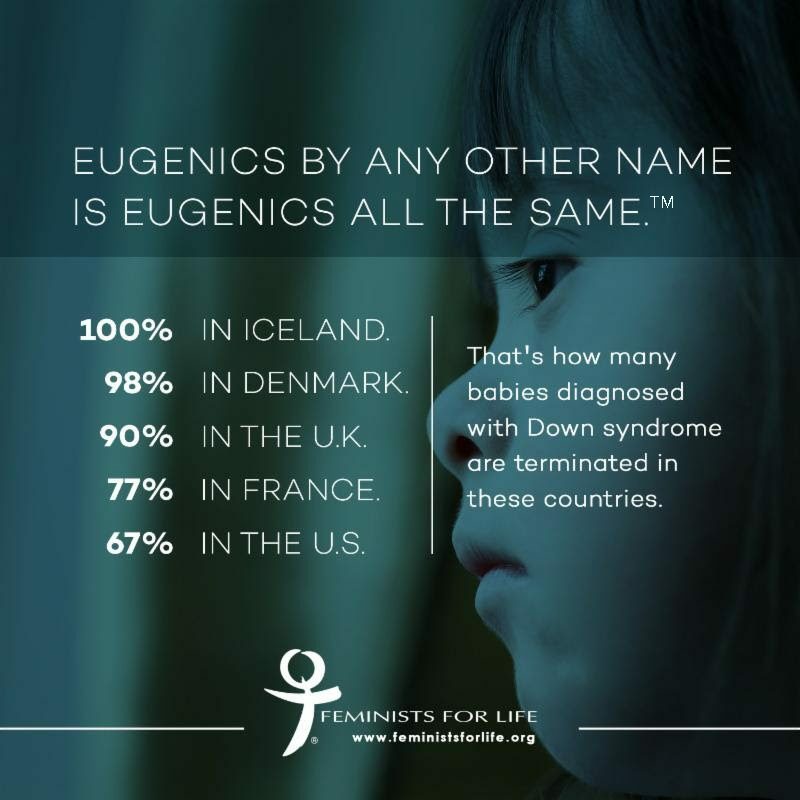 This desire for so-called perfection has resulted in the abortion of almost all children diagnosed with intellectual disabilities in many European countries. As scientists look to “cure” these embryos, they are destroying them. We ask: Who owns them? What if they are not destroyed? Will they be supported in artificial wombs and be experimented on and tortured like lab animals? Remember: Abortion advocates deny fetal pain. Why would they hear the cries of the unborn if allowed to live? Or if they were allowed to be “born,” would they become a group of second-class citizens, or even slaves? Knowing human nature of some in our world, count on the worst. The road to good intentions…. But apparently, the child of a royal (or anyone else) who has more than two children shouldn’t get a “fair start in life.” How different is this from China’s coercive two-child-per-couple policy? The state has rights over parents. Is there a safe space left on earth?? Our hearts ache for the parents as we also fell in love with little Charlie Gard. We found a similar story but a different ending with another couple in Britain who took their child out of the country against doctors’ orders. Their child received treatment, and three years later, he is alive and in need of more. Those parents were arrested for saving their child and are still fighting with the state. The real problem seems to be opening hearts and minds in a country where hospitals and courts have the final say over a child, not loving parents seeking treatment out of the national health care system. Charlie may still have died with experimental treatment early on — but if we never sought cures for childhood cancers, who would survive today? I look at the movement to protect animals — and keep thinking that WE need no-kill shelters for humans. As we begin a new school year, Feminists for Life of America redoubles our efforts to raise a generation of leaders who have problem-solving skills based on pro-life feminist principles and who believe in the strength and dignity of women, the value of every life, and the importance of both mothers and fathers when possible. Our work begins anew with the school year. Please support our efforts with your tax-deductible donation. Inspired by our work, a small group of donors will match your gift. Time is limited!! Please share our new social media images to help raise awareness about individuals with Down Syndrome.